I lost my best friend and companion tonight, Keydet the Labrador. Twelve years ago, while on a staff ride at Sharpsburg, I spied an advertisement for Lab puppies. As I had time before the staff ride began I went over to see them, there was one yellow male puppy left. A week later my friend Ed Bodling and I drove over and picked up that puppy. He was scared and cowered in the back of my pickup cab, but he was a wonderful bundle of gold soft fur with the biggest paws I have ever seen on a puppy. His full AKC name was Sir Madison Himsdog Keydet. As Labs are the nobility of dogs they should have royal title. Madison was after my favorite of the founders James Madison. Himsdog is what one my brothers called one of our dogs as kids. Keydet as he was the puppy of a VMI Keydet. He soon became Keydet. There are so many memories of this dog, none of which are bad. He was a fighter, and he was big. 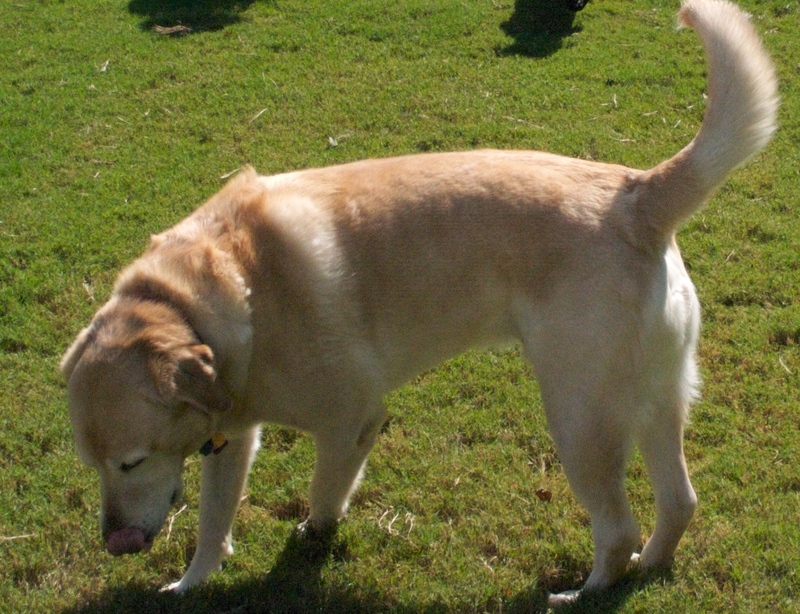 He had the biggest paws of any dog I have ever seen, he had the biggest head of any Lab I have ever seen. He traveled the world me. He trusted me. Keydet gave me unconditional love. All he asked was that I feed him, walk him, and be there for him. He traveled to Germany with me and nothing he enjoyed more that going on a Volksmarch. I still have the mental image of him asleep with his head alyin on the lap of my friend Dave Shutt’s son Charlie after a Volksmarch. He loved Volksmarches and was always willing to go and especially enjoyed the Wurst afterwards. He was there when I returned from Kosovo. He was there when I returned from Iraq, about knocking me over as he jumped and kissed me. He accepted my wife after we got married and grudgingly accepted her seven cats (now nine after I saw two very cute kittens). He was a double graduate of the University of Georgia Vet School having had both knees replaced. He was a fighter, who never whimpered but eagerly went on his rehab walks after both surgeries. He was never sick, until this week. This morning at about 2:30 am I had to make the hardest decision I have ever made, to end his suffering, to let him cross the “rainbow bridge.” He is gone. I have lost my best friend and companion. He will never be forgotten. Keydet you are now home, your legs work, you are no longer pain, someday we will be reunited, until then keep Da, Nanny, Patrick, and all the Foresman dogs company. My most profound sympathy Henry! We are great fans of Big Yellow Labs,…Have had two, Sheena, and Klondike and still get very blue thinking about the pooches. My condolences on the Cats as well and still do not understand cat people although I seem to have developed mutual tolerance of a 17yr old Tonkinese named Tonk that belongs to a friend. Why can’t people be more like dogs? They are forthright, loyal, all around great company and always happy to see us, And, if they are rabid we put them down even though their behavior may not be through fault of their own. Thanks for your kind words. It has been a very long day. . .filled with great memories. BTW we are neighbors as I believe you live somewhere in Prince William County, we are living off Davis Ford Road. Agains thanks.